Gather the ingredients for making Korean Chicken Stew. Then read the tricks found here. Prepare squash by cleaning the outside under running water. Slice the squash in half. Scoop out all the seeds from the squash. Slice the squash down to 1 1/2 in (3.5cm) slices. Cut the squash into chunks. Clean the chicken under running water. Take off the skin. Have your mise en place prepared before you begin to cook. In a big pot, on medium high heat, fry the chicken with minced garlic, pepper, sugar, and chili pepper powder. Cook for 5 to 10 minute. When the chicken is browned outside, change heat to medium. Add onion and soy sauce, then cook for 5 minutes. Add 3 quarts of water, change to medium high heat. Add carrot and potato in intervals. Add carrot and cook for 5 minutes. Then add potato and cook for 5 minutes. Add squash, cook for 5 minutes. Then add mushroom and cook for another 5 minutes. Make sure you check the potato and squash by stabbing them with a fork. It should slide in and out without having to shake the vegetable or pull the vegetable off the fork. Last, add green onions, cook for 1-2 minutes. Add more sugar and chilli pepper powder if needed. Add salt and pepper to taste. Be sure to use a stockpot that is made for making soups. Cooking soup or stew in a vessel that is made for soup or stew is much better than using your expensive stainless steel pots. Stain less steel pots are great for cooking pastas, but not ideal for cooking a soup or a stew. When you cook a soup or stew you want to cook in a vessel that has an enamel surface. An enamel surface stockpot is ideal for cooking soups and stews. With an enamel stockpot your soup or stew wont leave that stain in a ring around the area at the top of the soup or stew. Or at least you will be able to clean that area without the flavor and odor sticking to the inside. This way your soups and stews won’t taste or smell like the last thing you cooked. Use your stainless steel pots as they were designed, for cooking pasta and boiling water. 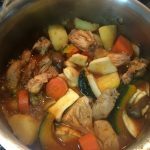 To make Dak Bokkeum Tang (Spicy Chicken Stew), start by preparing your ingredients placing them near the stove where you can work each step. Have a big and deep enough pot. Once your assembly line is ready, then follow the instructions.